This week Kenny and his team have created a tasty Coffee Shop Layout Pack with eight different pages that provide everything your average coffee shop will need to get up and running in just a few clicks. There are three mains things about coffee that attract people; the smell, the taste and the way it looks. Since adding a smell or taste to a website is physically impossible, a coffee shop website highly relies on the way it looks. 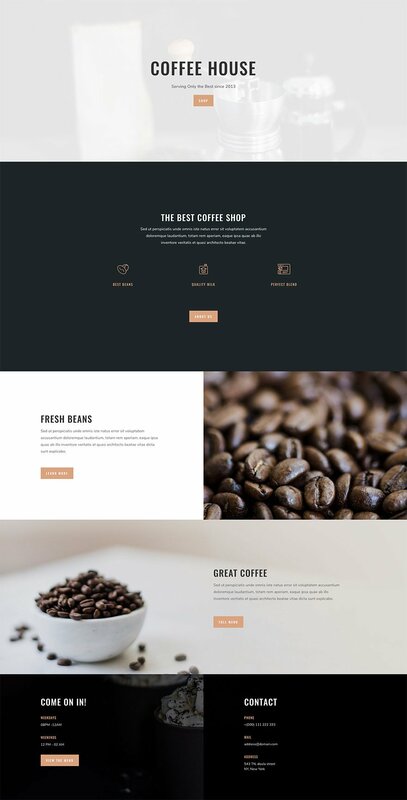 The design team has made use of a great color palette, high-quality images and expert use of Divi’s built-in design options to create a coffee layout pack that’ll leave your visitors speechless and intrigued. This eight-page coffee shop layout pack has everything you could possibly expect from a coffee shop website. Primarily; all of the practical information is continuously present on each layout of the website. There is a footer at the end of each one of the pages that shares the working hours and contact details elegantly and noticeably. On top of that, the visuals that are being provided in the different layouts are absolutely stunning and in line with the quality coffee you want to bring to your visitors. 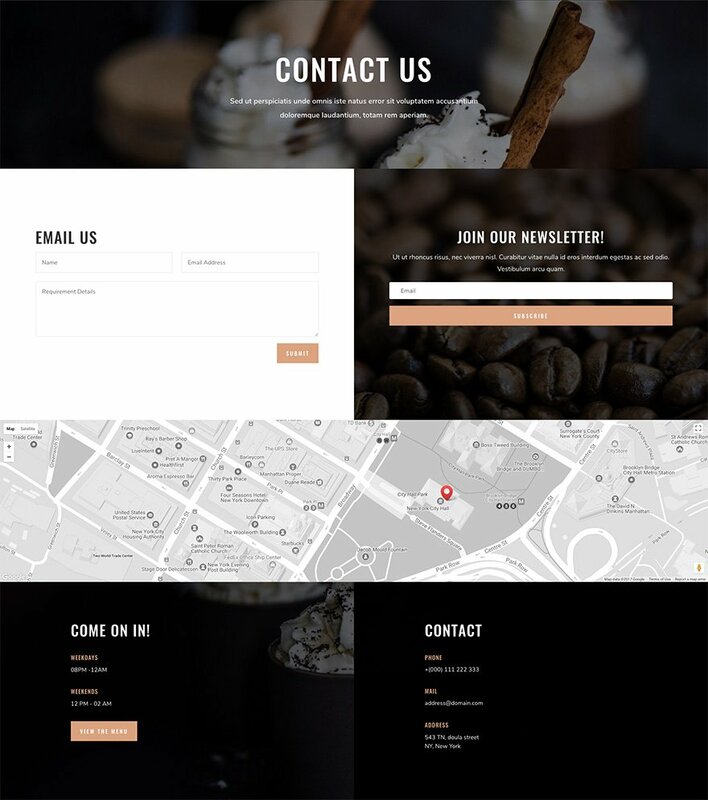 To use the Coffee Shop Layout Pack on your own Divi website, you will first need to download it using the button below. To gain access to the download you will need to subscribe to our Divi Daily email list by using the form below. As a new subscriber you will receive even more Divi goodness and a free Divi Layout pack every Monday! If you’re already on the list, simply enter your email address below and click download. You will not be “resubscribed” or receive extra emails. Once you have downloaded the layout pack, locate the divi-coffee-shop-layout-pack.zip file in your downloads folder on your computer. Double click the folder to unzip it and then navigate inside the divi-coffee-shop-layout-pack folder. Inside this folder you will find 8 files, each of which is a unique layout that you can import into your Divi Library. To do so, navigate in your WordPress Admin to Divi > Divi Library > Import & Export. You can select the individual layout you desire or choose the All Layouts file to important everything at once. We hope you enjoy this coffee shop layout pack. And to help ensure that you do, we’ll be doing a live stream on our Facebook page this Tuesday at 3pm EST to walk through what it might be like to actually use this layout for your own website instead of simply importing it and loading it up. We’ll talk header and footer design, customizer settings, converting certain sections to global, and more. FYI: The landing page link appears to be stalled or broken as of 10.08a CST. Update: Actually, multiple live preview links appear to be stalled or broken. Alex, please refer to the “How To Import The Divi Layout” video instructions in the article. Bill, the previews should work now. We had a problem with our CDN a couple of days ago but it should be fixed. Let me know if you still don’t appear to load correctly. Love these free layouts Donjete. This one is perhaps a tad dark for my taste and I’m looking for a really inviting cup of coffee for that first image. I have been a member for years since prior to Divi coming along. How can I catch up with all of the layouts you have released?? Please advise I am endeavoring to build an agency site for my clients offline and online marketing. This whole DIVI nation has royally helped my get an online business up and running. Thanks guys you were and are the answer to getting started. These layouts with all the photos specific to one industry are nice, but I would love to see ET create a small business general purpose layout pack that does not have quite as many photos. Will there be a layout for Web design / development? I know there is the Design Agency layout but looking for a layout specifically for Web design / development. Not the demo pages, nor the download link is working. Links working fine as off post of this comment. This looks great. Thanks for making it happen. These Librarys Layouts don’t seem to be working… I cant access any of the information and it also crashed DIVI when I imported them. Can you be so kind and recommend me how can I change the current layout avoiding the text destroying (everything what I’ve corrected already on my current layout), please? 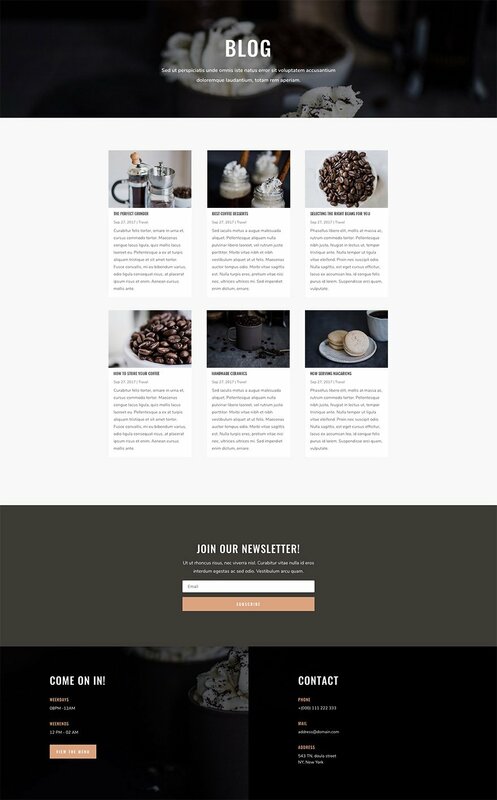 Theres something about Coffee Shop Website Design Layouts; there just so crisp and clean. Thanks Donjete! I’m painter and I would love to create professional looking page for my art and webshop, I haven’t found good layout for that. I have a words/names and details for every painting and haven’t manage to build a pro website that shows both the art and text with style. I have divi, but still a ready layout would be great help, thanks!